Jasper is my herding star. His first look at sheep was at 14 months old, and this laid back dog took to herding like he was bred for it! In 3 months he has gained his PT title with ease and great comments from the judges, one saying how well he rates stock for a novice dog. 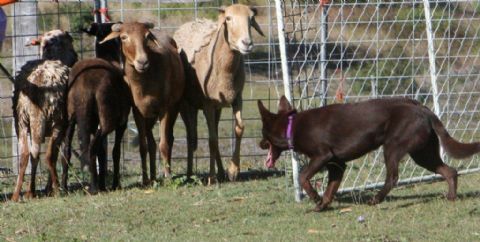 Our trainer Robert, has also said Jasper is the best bench bred kelpie he has seen work sheep. So I am in for some exciting times with this young man. Mary (Suthenskys Shameless Success HT) is also trying her hand at herding. She is a gentle dog, keeping nicely off the stock. As she is only young, I am not pushing her too much, so she is just being allowed to enjoy the stock and build her confidence.